Two days ago the FDA filed a request for a federal injunction against two fat stem cell, IV cure-all clinics. One was two hours east of Los Angeles, where Tarek was treated. That clinic was targeted because it was using or had plans to use a smallpox vaccine mixed with fat stem cells to treat cancer patients. In addition, the government filed to enjoin all stem cell use by anyone on the Cell Surgical Network. The doctor on the far left is Mark Berman and on the far right is Eliott Lander. Given that they received the lawsuit requesting a federal injunction two days ago in which the government sought to stop the pair from using SVF to treat all patients, was this procedure performed before or after they were notified? In addition, we know from the FDA documents filed in court yesterday that taking someone’s fat, processing it to get the cells out (this is called SVF for stromal vascular fraction), and injecting that IV, represents according to to the FDA, an illegal drug product that requires full FDA approval per medical indication. Just one medical indication is injecting SVF intravenously to treat low-back pain. No such FDA approval exists, so based on FDA’s reasoning, Tarek had an illegal drug therapy. 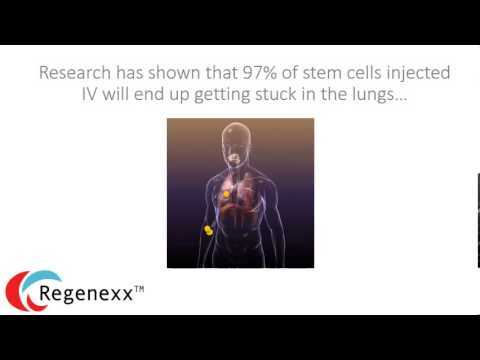 What Happens When You Inject Stem Cells IV? So why inject stem cells IV to treat a low back? Why not just find the structure that’s damaged in the low back and inject them there using precise imaging guidance? Only a select group of physicians understands how to place cells in the specific low-back structures using imaging guidance. Hence, if you’re a clinic with little expertise, you can easily find someone to start an IV. Based on animal studies where cells are tracked, ninety-seven percent of the cells that were injected IV into Tarek’s arm are now sitting in his lungs. He thinks he was injected with a million MSCs, and that may be right, depending on the amount of fat they took, but that number is likely a vast overestimate. If that’s true, then only around 33,000 made it out of the pulmonary first pass. That number would then be distributed throughout his body. Hence, only a very tiny percentage of that number would end up in blood vessels in the spine. Far worse is that this is a patient with a history of cancer in remission. We know that MSCs, when added to tumors, make those lesions bigger. Tumors are VERY vascular. Hence, if Tarek has any small lesions in his body brewing, injecting stem cells IV is the last thing you want to do. In fact, to date, we have no safety data focused on IV SVF injected in patients who have had prior tumors. Could This Work a Bit? Because MSCs can pump out anti-inflammatory cytokines, it’s possible that a procedure like this could reduce systemic inflammation (whole-body swelling). It’s also possible that this may tone down the pain a bit. It’s even possible that some of the cells may egress from the lungs at some point. However, based on my extensive experience in spinal low back orthobiologic injections, whatever is damaged in Tarek’s back will still be damaged. What Should Have Been Done? First, fat stem cells that the FDA considers an illegal drug product should never have been used. Second, a careful assessment of Tarek’s imaging as well as a thorough hands-on exam should have been used to ID what was wrong and then decisions made about where to target legal stem cell injections. Then precise imaging guidance (fluoroscopy and/or ultrasound) would be used to place the cells at those exact spots. Why settle for a few stem cells that might make their way from your arm to your back when you can have huge quantities placed right at that spot? genetically worn out or mutated MSCs from bone marrow from an old 75 tear old man like me who's everything is just about depleted. What has been your feedback on Neil's Clinic? Thanks for this post. You got it up very quickly. Well done. I tried to articulate this information to Tarek through instagram 2 days ago. His response was essentially, “Brent at Rock Institute referred me to this clinic and I was told that they are the best. Brent would never lead me astray”. This Brent individual has no medical training, but apparently he is trusted and completely comfortable giving out medical advice. Tarek basically would not listen to me and immediately wrote me off. You can lead a horse to water, but you can’t make them drink. Thanks again for your post. I get it that 97% of SVC's or MSC's introduced via IV get "stuck" in the lungs. I've seen several studies that confirm this. Just wondering - could these stem cells stuck in the lungs help lung-relatrd symptoms like COPD? What would you expect from Tarek? Got to be brain dead to let that wife get away!